I’ve been thinking a lot about housekeeping routines lately. I want a clean and tidy house. I spend most of my time here, and I find it difficult to write, try a new recipe or play a game with the kids when a cluttered, dirty house is staring me in the face. I think we do reasonably well, but I know we can do better. The thing is, I don’t want to think about keeping the house clean. I don’t want to resent the time it takes out of my day or feel guilty if I don’t take the time. I want it to become as automatic as brushing my teeth before bed, and not take much more time than that, either. But just as it’s not automatic for my kids to brush their teeth before bed (without a reminder–or three or four–they just won’t do it), housecleaning is not yet a mindless habit for me. This spring I’ve begun to think about my daily housework a little like my kids’ “morning work” that they do every day at school–just a few exercises that have to be completed before moving on to the rest of the day’s activities. For me, this includes emptying the dishwasher, loading the breakfast dishes, making my bed, and starting a load of laundry. In reality this routine only takes about half an hour. What I haven’t accomplished yet is adding–automating, really–the rest of the house cleaning. It isn’t that we don’t clean house. We just tend to do things on an as needed basis, an oh-my-gosh-I-can’t-stand-it-anymore-I-have-to-clean-it-right-now reaction. So the first mindless routine I worked on was laundry. With a family of five, in just a couple days our laundry bin is overflowing. I used to do it about three times a week, and made a special effort to be all caught up on Friday so nobody would have any laundry to do over the weekend. But then Monday morning would arrive, and I found it so disheartening to stumble down the basement stairs and face a toppling pile of dirty clothes. 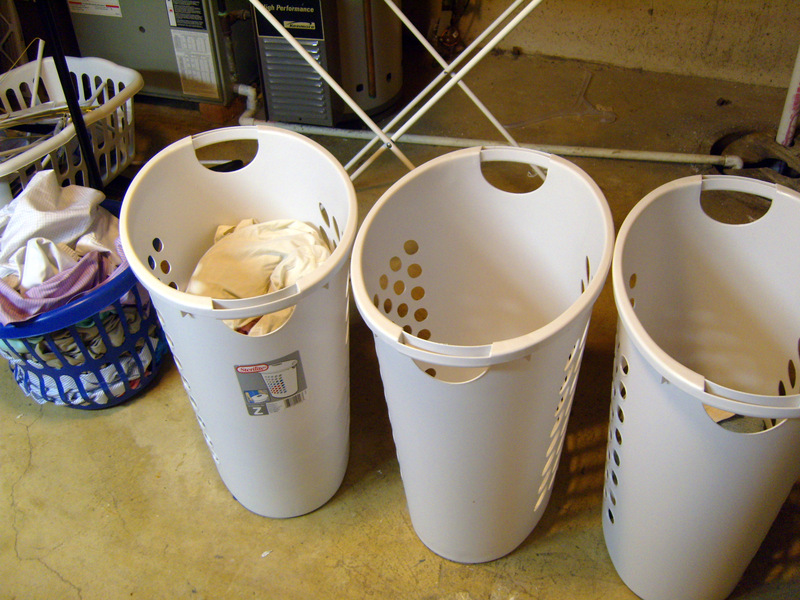 Whichever bin is most full gets washed…looks like whites are next! My new routine is simple. 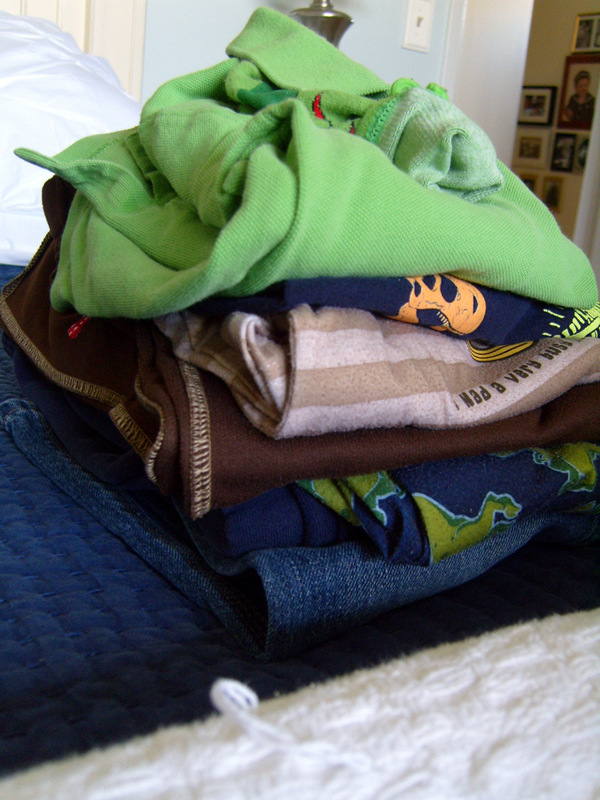 Every day–even Saturday and Sunday–I sort the dirty clothes in the bin (we have a laundry chute, so thankfully I don’t have to collect dirty clothes from upstairs), and every day I wash, dry, fold and put away one load. Sometimes there is an inevitable second load (usually involving one of the kid’s bedding), but most days it takes 10-15 minutes total. Honestly, today I timed myself and it took seven minutes to fold this basket of clothes. Exactly one more minute to put it away. I read somewhere that it takes three weeks to learn a new habit. After six weeks, I’m finally at the point where I don’t resent the laundry. No, really! I don’t even think about it anymore. I am always caught up. 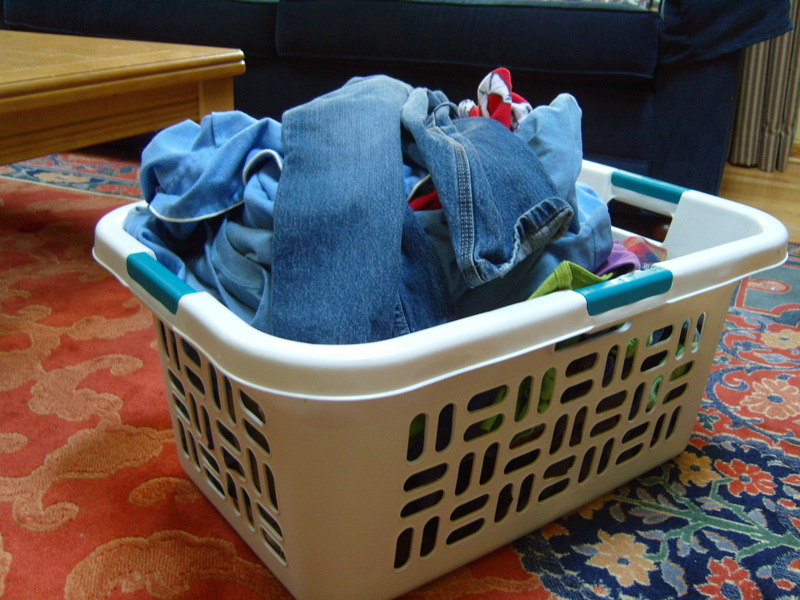 There are no overflowing bins, no baskets of wrinkled clothes waiting to be folded. And if, once in a while, I miss a day (things happen!) it’s not a big deal to get back on the horse, so to speak. I’ll be back in a few days to update you on how we’re doing with some other new routines, and whether the kids get on board with the project. When I suggested that it’s time they learned how to clean a toilet, I was met with expressions of abject horror. “But that’s SO GROSS!” Perhaps it’s time to watch some old episodes of How Clean is Your House?. Now that’s a horror show! I totally know what you mean about not really being able to get creative until everything else is done. Not perfectly, but at least some semblence of order. Type-A? Anyway, I’ve also created some kind of system so that I can optimize my writing time without having to get sidetracked by housework, that is still important for me to do. I dream of having several cleaners, a chef, and a gardener – basically the house staff of Downton Abbey (and honestly, I want the house too). But for now, me and my husband are all those things and more. Cleaning habits are so hard to establish and maintain. Good for you for keeping up the laundry, maybe good things will multiply out from here. Family of five here too. And when the kids were small the laundry overwhelmed me. I too developed a routine around it and I was amazed at how much more under control our whole life felt. That encouraged me to be more intentional in other tasks too. Little by little I felt like I reigned in the chaos and that was enough to keep me happy and sane. We’re only a family of 3, but it’s amazing how much laundry we create. I try to get a bunch of it done on Sundays, since I can do it while we otherwise hang out between batches. I work from home, so the last thing I want is to break during the day to deal with that. I’m also not a fan of working in my house when it’s a mess — part of the reason I’m so motivated to really get our place decluttered. It’s way easier to clean up when you have less stuff.